This video is part of our ongoing series on improving time tracking and time management. Find more articles in the series here. In this project management training video, Jennifer Bridges, PMP discusses the value of timesheets for project tracking and ways to make this drudge-work task actually fun for your whole team. True, timesheets are not fun, but they are essential to maintaining accurate data in your project. Plus with recent trends in the role of data analytics in project management and business, stale data is just not acceptable. Tracking hours is a fundamental responsibility of the project manager, as Jennifer noted. But that doesn’t mean that time tracking should be a tedious task, or something that the manager should do all by herself! You want your team to make filling out their timesheets second nature. So how do you do that? If you can incorporate all or some of these into your schedule, and then see how it plays out, chances are you’ll be surprised at the results. Work doesn’t have to be labor, and a team that is enjoying their tasks is a team that is productive. Pro-Tip: Stressing the importance of the most up-to-date data from every team member, is certainly key. Every member of your team needs to know that their performance is tied to not just their task deliverables, but their record-keeping too. Time tracking is essential for project managers. 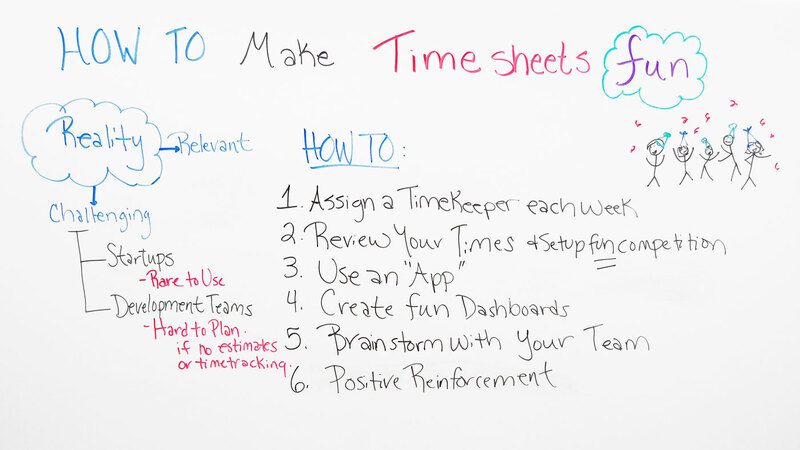 So, today we want to talk about how to make time sheets fun. Well, the reality is for project managers and project teams, timesheets are still relevant today, and they can still be challenging. They’re challenging in most cases in the scenario of a start-up, projects within start-ups, because the team is usually pretty small, and the workload is very high for the number of people on the team. So it’s rare that the team members use timesheets to track their time. So, it’s difficult to know the status of a project. Also within development teams, it’s hard for the development teams to plan if there are no estimates or time tracking on the project. So, a few things that we found helpful on some of our projects to make our timesheets fun is to assign a time-keeper each week. If you rotate a person who can touch base with all the team members to see, “Hey, have you done your time?” It’s not that most people don’t want to do their timesheets. In some cases, they’re so busy, they forget. So, you can have a reminder, but if you have a person who touches base with each person on the team, then it’s a gentle reminder for those who have possibly forgotten. You could also review your times and set up a fun competition. When I think of times, I sometimes think of sports, because as a competitor in sports you want to track your time, and you want to improve your times. So, you can set up a fun competition. You can even measure against yourself to see, am I improving my time? And the only way that you can do that is if you’re tracking your time. You can also use an app. Today, there are project management software tools and project management apps that will allow you to do that more effectively for your projects. You can also create fun dashboards. One project I was on, it was a relatively large project, and some complex variables, so they literally made a dashboard out of an entire wall. And so, as they met milestones and met different deliverables along the way, they updated it, and they made it fun pictorially. So they literally made it a work of art. You can also brainstorm with your team, get ideas from your team. “Hey, how can we make this fun?” It is important for the team, because that’s how you, in a lot of cases, bill for your work, and again, track the time within your project. If people get behind on their project, you’re going to impact other team members. You can also lend positive reinforcement for everybody on the team. The truth is, some people are better at tracking their time than others. So positive reinforcement for everyone helps everyone on the team. So if you need a tool that can help you make your timesheets fun, then sign up for our software now at ProjectManager.com.